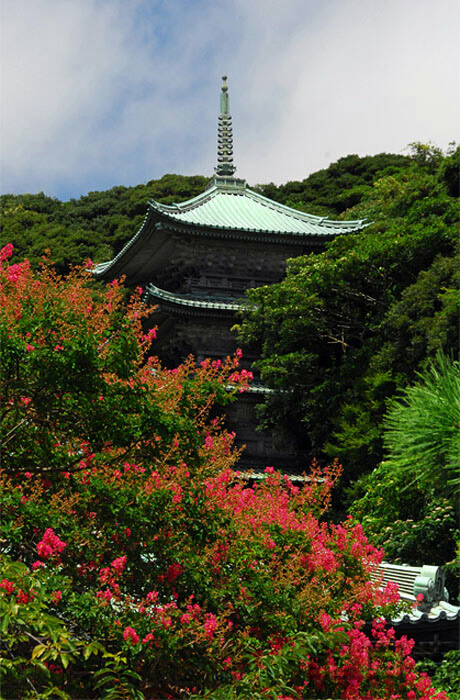 Ryukoji is located on the outskirts of Kamakura in a scenic area with a beautiful view of Enoshima Island. However, in the Kamakura period, this beautiful area used to be an execution ground called Tatsunokuchi. In June 1271, Kamakura was suffering from a great drought. Nichiren Shonin prayed for rain as did the priest Ryokan-bo Ninsho of the Gokurakuji Temple. Although Nichiren’s prayer brought rain and Ryokan's did not, Nichiren was summoned by the court on September 10. Nichiren Shonin submitted his writing, the “Rissho Ankoku Ron” to the government for a second time on September 12. That evening, he was arrested by Hei-no Yoritsuna who had attacked Nichiren Shonin’s dwelling at Matsubagayatsu in August of 1260. At the court, Nichiren Shonin remonstrated the government, “I, Nichiren, am like a pillar of Japan. Losing me is the same as a pillar of Japan toppling down. I predict that Japan will experience domestic rebellion and foreign invasion in 100 days.” As a result, the government decided to exile Nichiren Shonin to Sado Island and sent him to Honma’s residence in Echi, Kanagawa. However, Yoritsuna had secretly planned to execute Nichiren Shonin, so he was taken to the execution grounds at Tatsunokuchi on the night of September 12. At the moment when Nichiren Shonin was to be beheaded, an object shining like the moon at the edge of Enoshima Island flew across the sky like a ball of lightning. The executioner and guards were frightened by the sight, and Nichiren Shonin thus escaped execution. In September 1337, Nippo enshrined the founder Nichiren Shonin’s statue and founded the temple. In 1601, the Daihondo (Grand Hall) was built. The temple cares for the site of the execution grounds of Tatsunokuchi. The temple also holds the Daihondo Shoin (Temple Office), a gate donated in 1858 by the Konoike family of Osaka, and a five-story pagoda that was built in 1910. Nichiren Shonin’s statue, which is enshrined in the Daihondo, is known as one of three statues carved out of one tree. The other two statues are enshrined at Honmonji in Ikegami and Myohonji in Hikigayatsu. 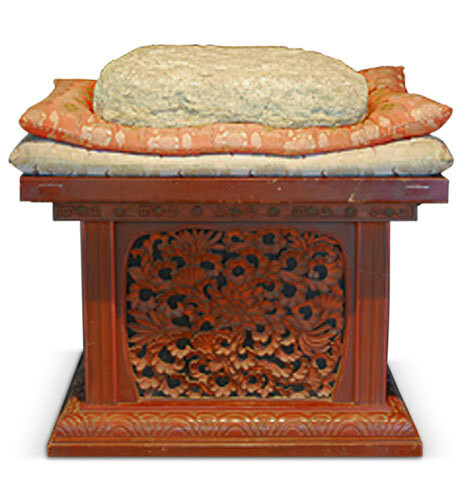 The execution stone on which Nichiren Shonin almost lost his life is on display at Ryukoji Temple.